On October 17, 2018, the Cannabis Act officially came into effect, permitting Canadians to legally purchase, possess and consume recreational cannabis. Amidst the excitement, a report published by the Conference Board of Canada indicated that more than half of Canadian employers expressed concerns about the potential effects that this significant legislative development would have on their workplace. 1 This level of concern is understandable given that Canada is only the second country worldwide (after Uruguay) to have legalized recreational cannabis. Consequently, Canadian employers are navigating uncharted waters, essentially acting as test subjects for the introduction of this once illegal substance into the public sphere. For those in HR, and the many payroll professionals who have dual payroll/human resource responsibilities, it can be difficult to know how to navigate this new world. The good news for employers it that that the issue of cannabis use in the workplace is not entirely new. Canadians have been legally permitted to obtain prescriptions to purchase and consume medicinal cannabis since 2001. Much case law has surrounded medicinal marijuana usage over the past decade, which will likely be heavily relied upon as issues arise within the workplace. Furthermore, the Canadian government has indicated that one of the key drivers behind this new legislation, is to thwart the rapidly burgeoning black market for recreational cannabis. This market has been estimated to generate a staggering $6 billion annually.2 To put this into perspective, in 2017, Canadians spent roughly $9 billion on beer, $7 billion on wine, and $5 billion on spirits.3 As such, the consumption of cannabis, whether it be for medicinal or unauthorized recreational purposes, is not a new phenomenon and may not cause a signiﬁcant impact on the the majority of Canadian workplaces, as many had assumed would be the case. Another piece of good news for employers? Comparable approach-es for managing this “new” substance in the workplace already exist. Nonetheless, employers must be aware that there is no singular approach that can be applied to managing cannabis in the workplace. Rather, we have been advising employers to utilize and supplement two existing approaches as the ﬁrst step towards developing a comprehensive approach to managing cannabis. 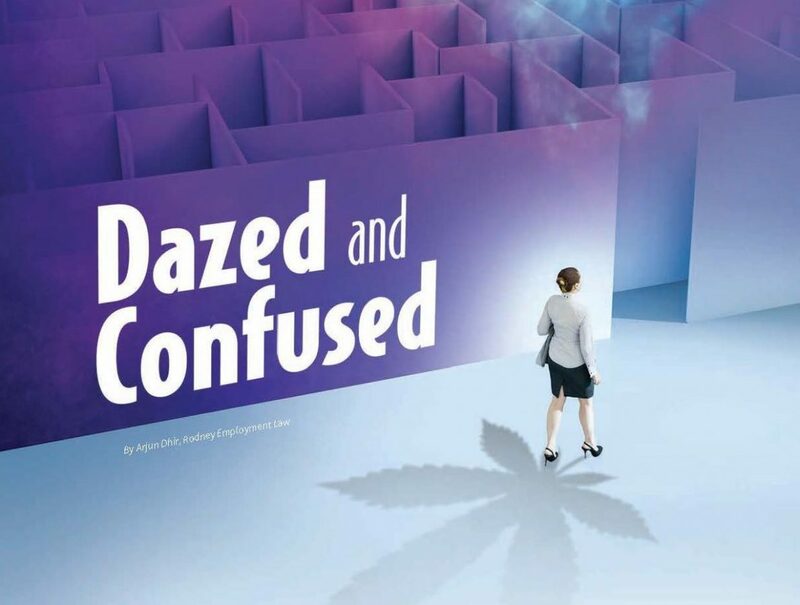 These two approaches relate to the managing of either recreational or medicinal cannabis in the workplace. Generally speaking, the simpler approach for employers is in regards to managing recreational cannabis in the workplace. This is because employers can, and should, develop and supplement policies surrounding the consumption of recreational cannabis in a similar manner to that of alcohol in the workplace. Employers will likely take a zero-tolerance stance towards the consumption, sale, distribution, delivery or impairment by way of recreational cannabis during working hours and/or on the premises of the business. However, what will likely be the major differentiator between the two substances, at least from the outset, is how recreational cannabis will be treated in work-settings where the consumption of alcohol is permitted (ie. holiday parties). In this regard, whether an employer decides to permit the consumption of cannabis in these settings or not, it is imperative that the organization’s expectations are clearly communicated and understood by staff. By setting out expectations at the forefront, and having employees sign an acknowledgement accepting these policies, the organization can ensure that they are not met with any unwelcome surprises down the road. Alongside the legal duty to accommodate, employers are also given a corresponding legal duty to “take every precaution reasonable in circumstances to protect a worker.” This legal duty is further heightened when managing employees working in ‘safety-sensitive’ positions. ‘Safety-sensitive’ is deﬁned by the Canadian Human Rights Commission as any position in which impairment could result in a signiﬁcant risk of injury to the employee, others or the work environment.4 As such, this deﬁnition applies broadly to a number of industries including, but not limited to, construction, childcare, healthcare, and law enforcement. Thus, when faced with accommodation requests, employers are given the challenging task of balancing their legal duty to accommodate with safety considerations. This process requires a careful approach that involves talking with the employee to gain a thorough understanding of their restrictions and limitations. Ultimately, accommodation requires that both the employer and employee put forth a reasonable effort to ﬁnd a viable solution. We anticipate that legalization will result in gradual changes in both the public and private spheres. For instance, there will likely be a destigmatization surrounding the consumption of cannabis, resulting in the consumption of the substance slowly becoming normalized both within the private and public spheres of inﬂuence. Eventually, the stereotypical cannabis user will no longer be in the image of the long-haired, slow-talking, low-functioning ‘stoner’, but rather your family, your next-door neighbour, and even your employees. Given this imminent reality, it is imperative that employers begin taking proactive steps to prepare their workplaces for cannabis’ expected rise to prominence. Going forward, employers can prepare themselves by taking positive steps to implement or update workplace policies, including both accommodation and drug and alcohol policies. Employers operating in a ‘safety sensitive’ industry should speciﬁcally outline particular positions as ‘safety-sensitive’ and broadly require employees to disclose the prescribed use of impairment-inducing medication. Subsequently, employers are encouraged to train, educate and clearly communicate new and existing policies to managers and employees to ensure that everyone is up to speed on the organization’s expectations. The best way for employers to protect their workplaces is to seek out professional legal advice to ensure that they are taking the correct steps.